Düsseldorf, Germany, November 21, 2002, Leading European medical device manufacturer and supplier of electrocardiographs, spirometers, MRI monitors, defibrillators and patient monitors, Schiller AG Corporation (Baar, Switzerland), and Masimo Corporation, innovator of motion and low perfusion-tolerant pulse oximetry technology, today announced an agreement whereby Schiller will make Masimo SET its exclusive pulse oximetry technology. "Alfred Schiller, Founder and Chief Executive Officer of Schiller stated, "Masimo and Schiller have enjoyed a successful business relationship for over five years. We realized in 1996, when we first met with Masimo, that Masimo SET pulse oximetry was likely to become the standard of care for monitoring patients at risk of hypoxemia. 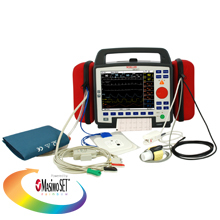 Today indeed Masimo SET has become the standard for pulse oximetry. Not only has Masimo's innovation changed how pulse oximeters are regarded, but clinicians consider Masimo as the safest and most reliable pulse oximeter; they ask for Masimo by name." "Schiller has been a leader in electrocardiography and a leader in improving the process of care in hospitals with innovative solutions, such as the PB1000. Schiller is a world-class organization with outstanding technology; we are delighted that after nearly six years of doing business together, Schiller is further committing to Masimo SET by making it their exclusive pulse oximetry technology," said Joe E. Kiani, CEO and Chairman of the Board of Masimo. "100% of the Healthcare providers throughout the world who have chosen Schiller's products for their quality and value, can now be assured they will also realize the benefits of Masimo SET pulse oximetry in the care of their patients." Founded in 1974 by Physicist Alfred E. Schiller, Schiller's leading-edge position in world markets is based on the mastery and combination of clearly defined core competencies, including Research and Development, Product Management, Sales and Technical Service and Quality. Schiller's rich product portfolio includes solutions for ECG/Ergometry, Cardiopulmonary, Patient Monitoring, Defibrillators, Telemedicine, Blood Pressure and Data Management and software. Schiller products are manufactured under stringent quality control conditions, meeting ISO 9001:2000 / EN 46001 and CE-0123 label certifications, as well as fulfilling the EU medical Products Directive 93/42/EEC, Annex II.3. Through continued improvement of its processes and quality, as well as the periodical inspection by the Notified Body TÜV, Schiller products fulfill all relevant safety and EMC requirements.